Lancris Residences is the forefront in stylish condo living, will hold a wine tasting event on Saturday, October 24, 2015, at seven in the evening. 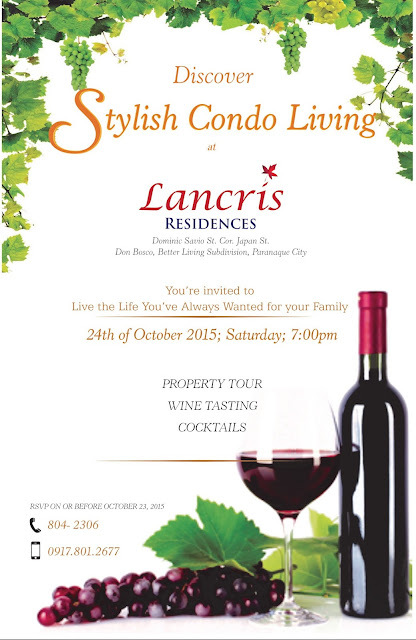 To know more information about Lancris Residences, you may check their website and follow Lancris Residences in social media accounts. Take EDSA Hi-Way south-bound route. Upon reaching Magallanes Interchange flyover, follow the lane going to Nichols/SLEX. Drive straight and exit to Bicutan upon approaching SM City Bicutan. Turn right to Doña Soledad Avenue. Drive straight towards BDO and turn left to France Street on your left side. Turn right to Iran Street. Drive straight towards Japan Street. Lancris Residences gate is located at the Corner of Dominic Savio & Japan Streets. Climb C5 flyover going to SLEX south-bound. Exit to Bicutan upon approaching SM City Bicutan.